Deutsche Welle explored the role of Alegion and a couple other companies in utilizing the crowd to to enable artificial intelligence. It noted not only that Alegion is creating jobs, but educating workers so they can be more effective. One of the Huffington Post’s most high-profile columnist has written about Alegion and the powerful role it plays in the responsible growth of the AI/ML industry. Journalist James Moore also praised Alegion for its ability to source the crowd and “turn data into the clean information needed” to fuel that growth. In an insightful piece entitled “The Future of AI Depends on a Huge Workforce of Human Teachers,” Businessweek Magazine recently identified Alegion as one of the companies harnessing the crowd for AI and Machine Learning initiatives. Journalist Matthew Hutson spent hours with Alegion CEO Nathaniel Gates and Vice President Chip Ray reporting for the story. 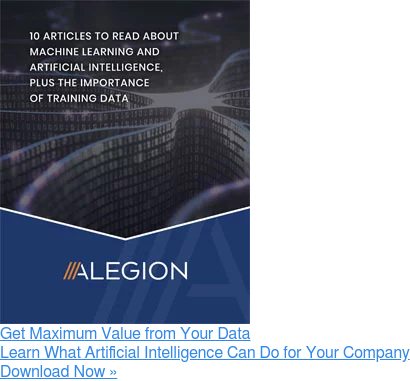 The Marketing Artificial Intelligence Institute singled out Alegion for providing “a workforce that is able to assemble AI training data and scoring at scale. Using a crowdsourced workforce from services like Amazon’s Mechanical Turk, Alegion builds large-scale, custom datasets that brands then use to train AI algorithms.” An interview with Alegion CEO Nathaniel Gates follows at the link below. Alegion CEO Nathaniel Gates told Seeking Alpha that Alegion is “uniquely positioned to supply the human intelligence that is required to enable artificial intelligence.” Check out the story at the link below. Yahoo! Finance recently quoted Alegion CEO Nathaniel Gates about the company’s formula of introducing “human intelligence into the (data procurement) process, which provides the quality and scale necessary to achieve rapid, successful results."